I was born in 1968 in a suburb of Atlanta, GA. I remember visiting my grandparents during the 70's and hearing from my dad at times about our Patterson ancestors. I always heard the stories about a set of brothers who immigrated to America and split up. They were "Scotch-Irish" as the tale went, but nothing more was known directly of them, such as their names, their location of residence prior to immigrating, where they "landed", what year, etc. As I wrote previously in my article titled "There Were Five Brothers", in recent years I've had the great fortune to be able to answer many of those questions. If They Split Up, Where'd They Go? These five brothers were sons of Robert Patterson who was born ca. 1705-1711. Robert and his wife Sarah had at least five sons and at least five daughters. The sons that we know of were named Thomas, James, Robert, Peter, and William. It appears that son James died around 1774-75 in York Co SC. And son William, while recorded as living during the Revolutionary War (listed as a Tory in SC), nothing further has been found of him after that time frame. Peter appears to have remained in SC and died there around 1800, give or take a couple years. Robert (II) moved to Rutherford Co NC and then later to McMinn Co TN where he died in 1827.
surrounding the land from which this picture was taken. Thomas Patterson owned 50 acres beyond the distant hill. Oldest son Thomas Patterson (my ancestor) moved to Buncombe Co NC in the 1790's apparently, perhaps even a little earlier. He was still living there in 1800 near his son John (also my ancestor). 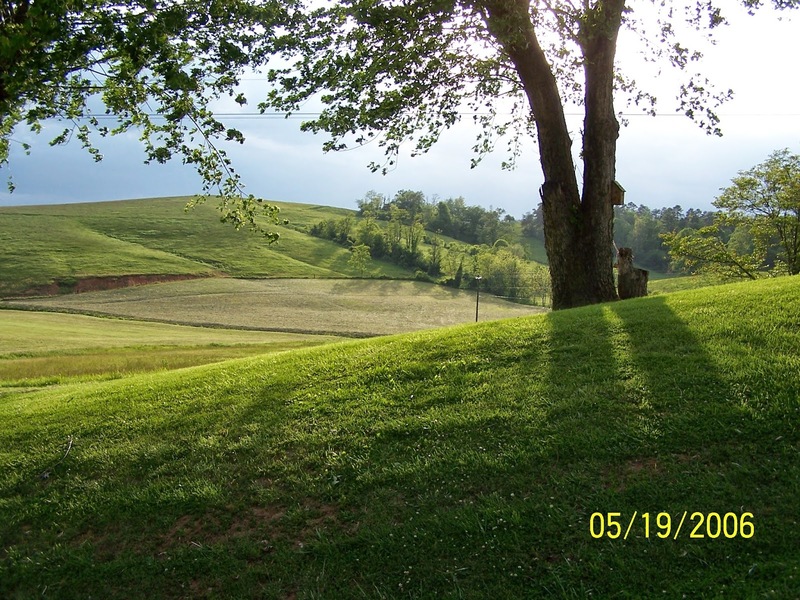 However, Thomas' land in Buncombe was sold at auction by the sheriff a couple years later, and nothing further has been found regarding Thomas. So it appears that the legend of multiple brothers applies to Thomas, James, Robert, Peter, and William Patterson. We're not sure what happened to William, but it seems James and Peter died in SC. Thomas died in NC apparently, and Robert II settled in Tennessee, thus fitting the legend that the brothers "split up". Our family from north Georgia always knew of our ancestor John Patterson, the old patriarch who died not too many years after migrating to north GA from western NC in the 1820's. Old John died after 1840 but before 1850, but that's all we know. This is the same John that was living in Buncombe in 1800. We now know that John was the oldest son of Thomas Patterson (one of the five brothers of family legend). John Patterson was born ca. 1762-65 and died in Union Co GA after 1840. He was my gggg-grandfather. Therefore my ancestor (Thomas) who was one of the legendary brothers, was my ggggg-grandfather. Perhaps one day I'll find where he died and was buried. Why not? Those other "dreams" of finding their names, locations, and dates all came true!